Inventory We are a resale marketplace, not a box office or venue. Ticket prices may exceed face value. This site is not owned by Dunkin Donuts Center . 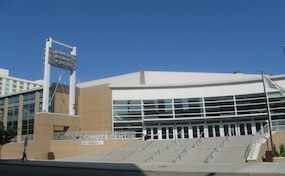 The Dunkin Donuts Center is the epicenter for entertainment is Providence Rhode Island. With many of the big name acts who choose to tour the east coast the Dunkin Donuts Center has the ability to pull them in and sell them out. The Dunkin Donuts Center has a long tradition of box office success that also includes the Providence Friars in college basketball. With a seating capacity of 13,000 there are sufficient seat views. CenterProvidence.com is a privately held company that specializes in the sale of tickets in the secondary market. We are not affiliated with any official supplier or box office. To purchase tickets to any Dunkin Donuts Center in Providence events simply call our operators at anytime or click on the event you wish to attend.